[Image: A fenced-off, back alley security stair in Toronto, via Google Street View; view larger]. 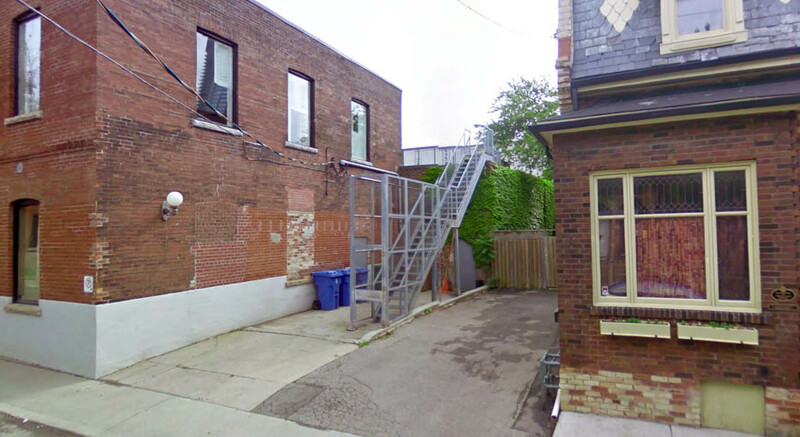 A link on Twitter from Andrew Lovett-Barron led me to this otherwise innocuous fenced-in back alley staircase in Toronto, pictured here via Google Street View (view larger). There's something oddly compelling about this minor architecture of out-of-place private access—as if implying that buildings could begin blocks and blocks away from where they actually rest in urban space, splayed out into the neighborhoods around them like chain-linked octopi, reaching out with stairways, doors, and catwalks across the roofs and back streets of the city. A Home Depot vernacular stretched to Berlin Wall-like proportions. You don't like your address, you simply hurl a chain-linked access stair up over and out to whatever street you prefer—and you enter there, turning a key and stepping into a steel maze of steps and ladders, cantilevered walkways and pillared decks. Fifteen minutes later, passing over and beneath ribbons of other parallel geographies, looping down alleys and nesting briefly on thin platforms in the canopies of trees, walking alone in this isolated cocoon like a private enclave in the city, you're home. Wonderful. I imagine being a child living in that neighborhood and inventing stories for where that might lead - someplace so amazing that it's not enough to lock the doors, even the staircase is caged in like a dangerous animal. Things like this reinforce my belief that one of the nicest things we can do for future civilizations is to put the entire Streetview database on some durable storage medium and bury it in concrete. Where is Piranesi when he's most needed? This is fascinating, and there are many similar findings in history, particularlywhen an elite wants to create a parallel infratructure overlaying the "real" world of the common populace. The parallel train and road infrastructure in North Korea including the private train to Kom Jong-ils residence in Sinuiju. Chinese emperors have allegedly constructed private palace water supply canals to ensure safe sources of good water for the courts.